Beach season is right around the corner, which means most people will be attempting to eat healthier and exercise more. 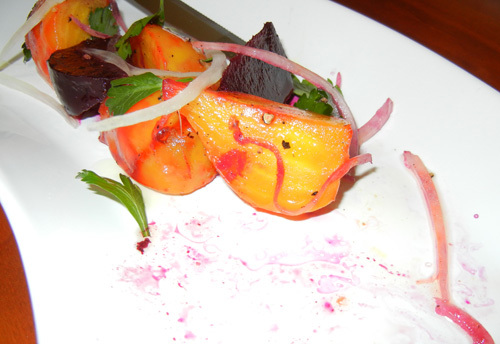 Roasting beets is slowly becoming the cool thing to do in many fine dining restaurant. 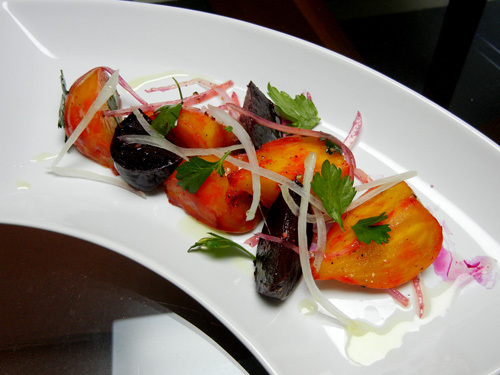 In going with that trend, here is a recipe for a light and fresh roasted beet salad. § Remove the stems from the top of the beets, then thoroughly wash and dry. Toss the beets with some salt, pepper and ½ tablespoon olive oil then place on a baking dish. Fill the baking dish with about ¼ inch of water. § Preheat the oven to 400F and then cook the beets for approximately 40 minutes. Once the beets are knife tender, allow them to cool and then peel the exterior skin. § Cut all the beets into quarters. Toss only the yellow beets with the onions, parsley leaves, the rest of the olive oil, vinegar, salt and pepper. Add the purple beets once the salad is tossed in order to avoid everything turning purple.